How are RamRodz better than existing methods? 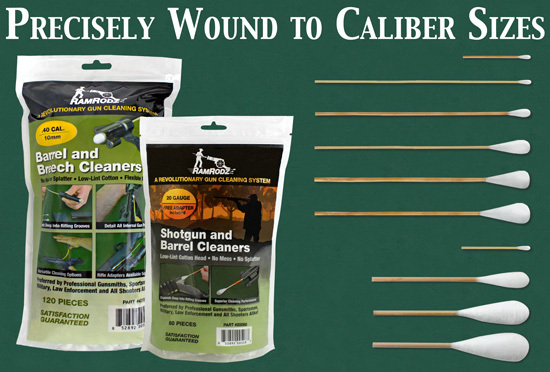 RamRodz are caliber-specific, disposable gun swabs specially engineered to clean firearms (available in .22, .38, .40, .45 and 50 calibers). The industrial-grade cotton heads are wound to precise caliber sizes to clean the maximum surface area with each pass down the barrel. The density of the low-lint cotton soaks up cleaning solvent without any drip or splatter and releases only as the head is squeezed into the bore. This ensures a more efficient cleaning method and a cleaner work environment. RamRodz are favored for their strong, yet flexible 8″ bamboo handles that bend, but don’t break, providing unparalleled access to hard-to-reach areas. 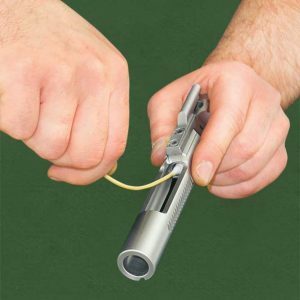 They are also great for cleaning all internal gun parts, not just the barrels. 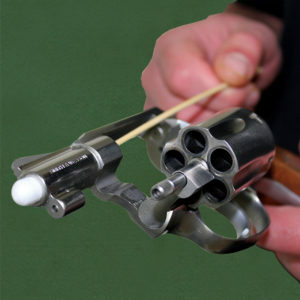 Using RamRodz for the first time will change your outlook on firearm cleaning. Simplistic, yet incredibly effective and efficient, there simply is no better way than RamRodz. indicating the fouling removed from the grooves. If you watch a patch closely, the edges of the cotton fold back as it runs down the bore and do not get pushed up into the rifling grooves. A patch will leave uneven streak marks indicating less surface area has been cleaned. You can imagine how many more passes a patch will take to achieve the same amount of cleaning as Ramrodz. These products can be great for a quick field clean and certainly have their place in the market. However, when compared side by side, you’ll find that RamRodz clean the rifling grooves much more thoroughly. They are also disposable, so rather than washing and reusing a tool multiple times, you start with a pristine product and assess the cleanliness of the bore by observing the debris marks on the swab as it exits the muzzle. Furthermore, RamRodz can be used to clean ALL gun components, not just the barrel. Everyone knows that patches are the cheapest way to clean a gun, right? Actually, this is no longer the case. On average, RamRodz are more cost effective than any comparable products on the market. An individual RamRodz only costs a penny more than a patch. However, considering it takes roughly three times as many patches to match a single RamRodz cleaning, RamRodz are easily the less expensive option. RamRodz are available through shooting sports wholesalers as well as factory direct to qualified gun shops and ranges. Please use our Dealer Locator to learn where the closest distributor is to you. If you’d like further details about becoming a dealer, please fill out our Dealer Account Form here. We are passionate about contributing to the shooting sports. If you shoot competitively or host events at your range, please contact us at information@ramrodz.com regarding sponsorship opportunities.